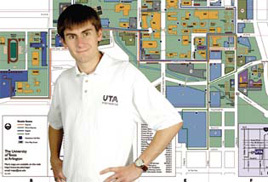 One of award-winning student Stephen Olivier's research projects involved devising a wireless bus tracking system using UT Arlington's shuttle bus route as a model. The research bug bit Stephen Olivier early in his college career. As a computer science and engineering junior at The University of Texas at Arlington, he decided to seek a graduate degree and wanted to start preparing right away. While considering research possibilities, he learned that the National Science Foundation offered a summer program to involve students from across the nation in research projects at UT Arlington. Olivier applied and was accepted. He worked on MavHome, an apartment dedicated to research with intelligent technology. The apartment features electronically controlled appliances, lighting and thermostats, among other items. Each student was assigned a portion of the technology to study and enhance. “The home learns the activity patterns of its inhabitants and uses this information to automate functions,” explained computer science and engineering Professor Diane Cook, who secured a National Science Foundation grant to fund the project. Olivier created software to simulate the way appliances could work together, such as a refrigerator communicating with a microwave oven concerning food removed from the refrigerator and cooking options. The object was to help people streamline food preparation and other household tasks. “Once you start doing research, you never want to go back,” said Olivier, a Baton Rouge, La., native who chose UT Arlington because of its nationally recognized Computer Science and Engineering Department. Fresh off his summer experience, Olivier tackled a wireless bus tracking system. His team based its project on a paper presented by James Marka of the University of California, Irvine. Dr. Marka was the first to achieve wireless communication in a vehicle traveling more than 30 miles per hour for distances greater than 1,000 meters from network access points. The wireless technology is the standard Wi-Fi used to access Internet connections, which utilizes different frequencies than cellular. The goal was to devise a standard Wi-Fi system to track the location of buses. UT Arlington’s shuttle bus route was used as the model. Led by Olivier, team members designed software to display the bus route/map on a computer monitor. Carrying a portable global positioning system, one of the team members functioned as “the bus” and traveled the route as the others watched his positions being transmitted from each stop along the way. Olivier and his team gave several examples of how this free technology could be applied to American life, but all of the uses depend on the service provider having enough wireless access points. Grand Rapids, Mich., is among the few American cities that claim to be entirely equipped with Wi-Fi access points. If UT Arlington implemented this service, students would know how long before the shuttle would arrive at any bus stop on campus, thereby possibly promoting more use of the shuttle with less wait time. The same could hold true for a city bus system or any number of other endeavors, such as dispatching pizza deliverers. “Stephen was an excellent leader who really cared about the quality of our work,” team member Joshua Mayer said. Olivier carried those qualities back to the MavHome project. During his last semester as an undergraduate, he was a research assistant for Dr. Cook. Earlier this year, Olivier, a 4.0 student, received the Technical Club of Dallas’ Outstanding Senior Award. The honor recognizes scholarly achievement and leadership abilities that best exemplify the future leaders of the engineering and technical professions. He was a member of the Honors College and several honor societies and received scholarships from Motorola, National Semiconductor and Sabre. He graduated in 2005 and is pursuing a master’s degree at the University of North Carolina at Chapel Hill. His research will concentrate on computer networking traffic, particularly with low-performing networks and where the packets of information (data) bottleneck as they travel through the line. Olivier is grateful for the research opportunities UT Arlington provided.